ISS provides highly skilled interpreters with extensive experience in their fields of expertise, in both business and administrative applications. ISS provides skilled interpreters with experience in business and administrative applications. ISS provides comprehensive support for organizing various conventions including international conferences. ISS provides comprehensive support for organizing conventions and conferences. ISS provides a range of personnel services including interpreters, translators, and bilingual professionals. ISS provides a range of personnel services with a focus on language professionals. 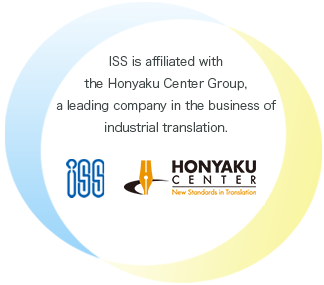 Our affiliated company, Honyaku Center, provides quality translation services in four main fields of expertise. Honyaku Center provides quality translation services in four main fields of expertise. ISS Institute offers a range of language training services for companies, including interpreter and translator training for English and Chinese. ISS Institute offers linguist training and language instruction services for businesses.